WITH its bowling-club beige paint, a nasty crease in the passenger door and bird poo stains on the roof, most of us would’ve walk straight past this XD Falcon in a Coles or Bunnings car park – even with the XD’s emerging popularity as a collectors’ keeper. 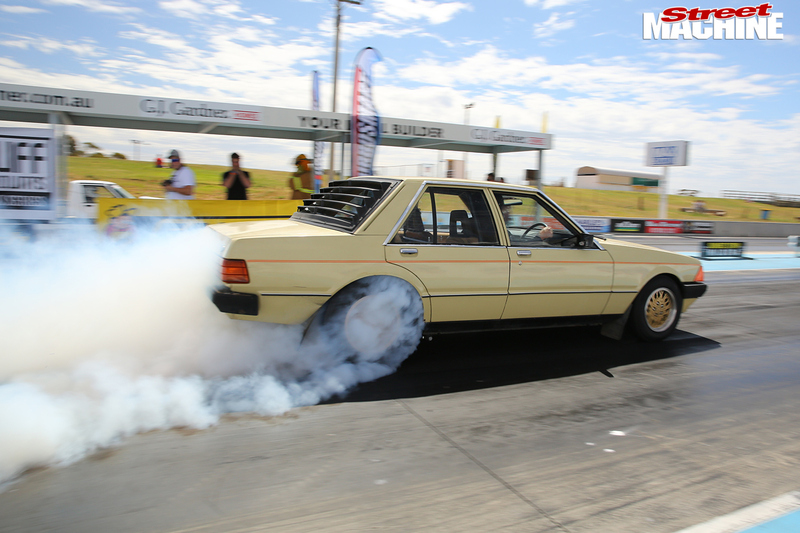 But this was Street Machine’s Drag Challenge and it had just idled into the pit area at Calder Park and disgorged a bunch of eager – if very tired-looking – blokes. Maybe it’s time for a closer look. Whoa! 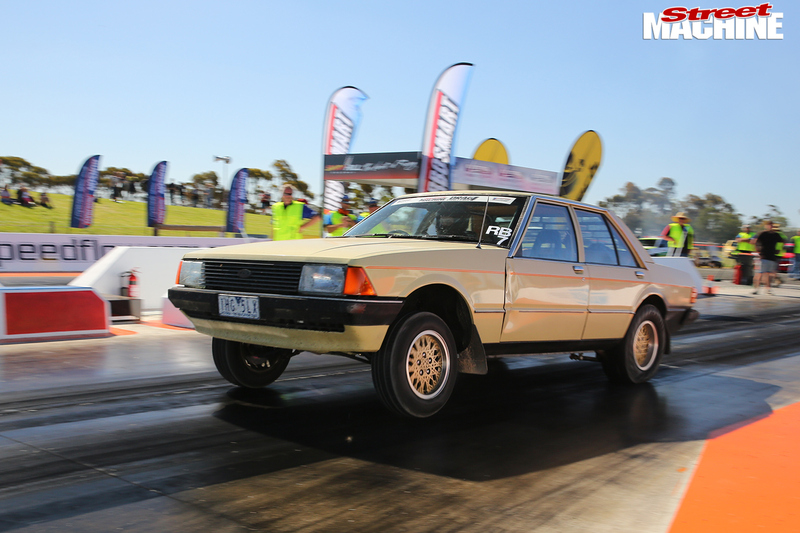 The Falcon’s exterior paint might be well-patinaed – it was bought from a 72-year-old bloke late last year – but under that chalky beige bonnet is a Ford Barra twin-cam six transplant with one of Drag Challenge’s biggest-looking turbos. The engine bay is presented to an almost Summernats standard, a terrific backdrop for the subtly detailed engine with its silver and satin-black paint, plus of course the gorgeous alloy manifold and pipework. Get down on your hands and knees for a squint underneath and there’s plenty of craft: The rear end has been re-engineered with an LMS CalTrac-style set-up and Calvert mono-leaf springs. The fuel tank is now in the boot. All four dampers are adjustable Gazzard Brothers items, and the brakes have been upgraded with later, bigger Falcon front calipers and rotors and a Nissan-based rear disc conversion. The stealth appearance is complete with tatty original bumpers, standard seats and interior trim – although there is an ANDRA-spec ’cage tucked in there, too – and a rear window louvre. Only the alloy wheels might raise an eyebrow among keen car freaks; starting life as stock snowflakes from an XE Fairmont Ghia ESP, they’ve been re-rimmed to take a 275 tyre. The car is the pride and joy of Jason from Tunnel Vision Turbocharging, who’s rather handy with a laptop and a set of spanners. Obviously! 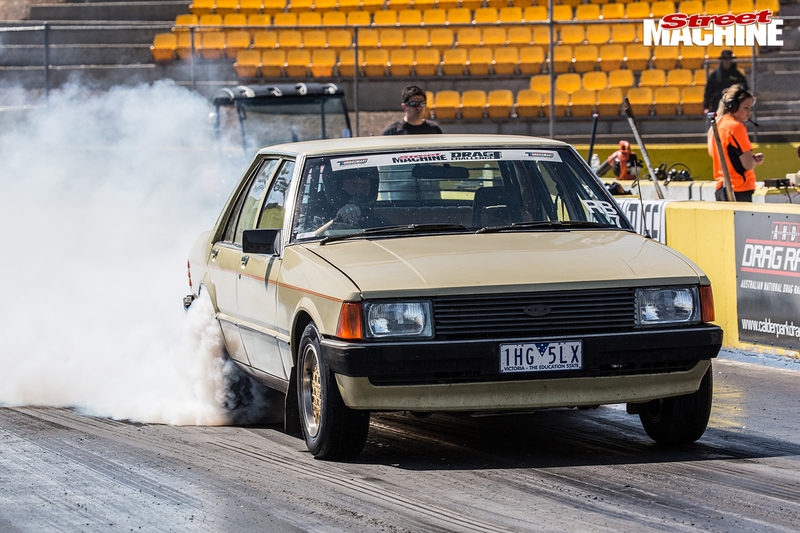 The basics of the ex-FG Falcon Barra are billet crank, I-beam rods, custom-made forged SPS pistons and 24psi from the Garrett GT47 ball-bearing booster. “The exhaust was a nightmare,” Jason says of his beautifully fabricated manifold hidden below the right-in-your-face turbo. Looking sensational on the other side of the engine is the CNC-machined intake, Jason’s own design. With Haltech Elite management, the engine cranks out just shy of 800kW at the treads and spins to 7500rpm. Behind the big six is a tweaked TH400 and the racers’ favourite nine-inch. 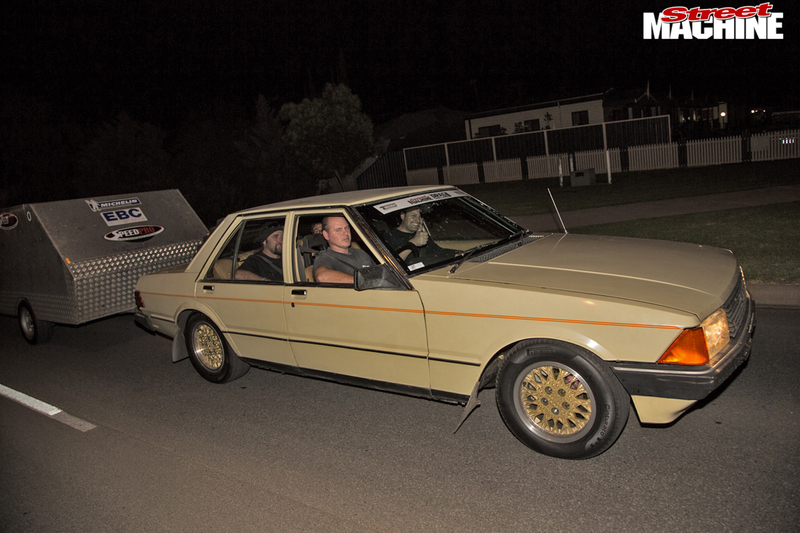 The reason Jason, Vince and the crew were so tired when we met them was because the Falcon was a rolling shell four days before Drag Challenge – it had been a busy weekend. The lads arrived at the event just in the nick of time on Day One, having completed the car at 11 that morning. They were obviously ready for action, running a 9.2@150mph at Calder Park and a 9.3@151mph the next day at Heathcote – before discovering the rear tyres were turning 90 degrees on the rims. 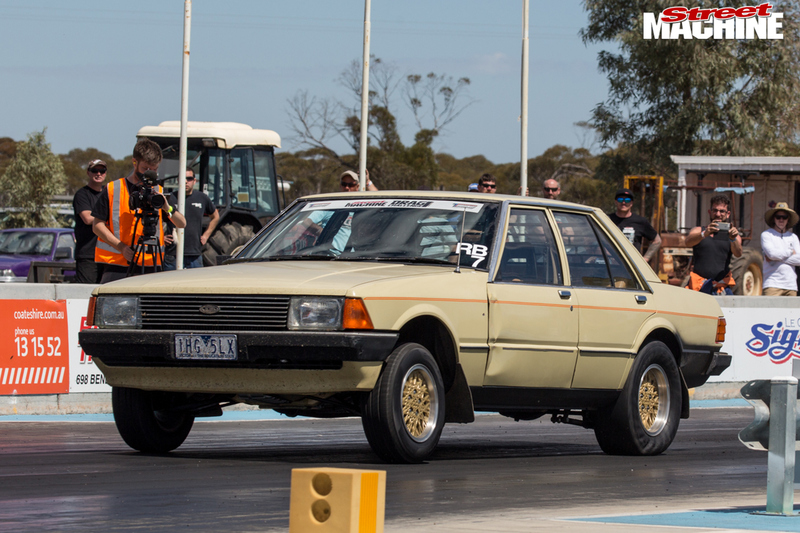 The car’s best result of the week was 9.04@155mph at the terrific new Swan Hill track. 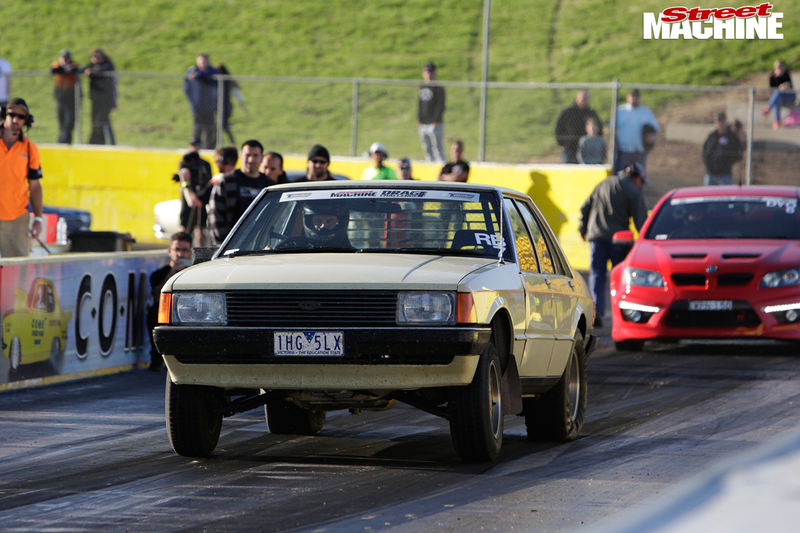 Jason finished Drag Challenge in 11th place overall and took home the Quickest Six-Cylinder and Quickest Ford awards.